The aptly titled Passive with Desire is every bit as dramatic as it sounds, and puzzling, too. The moody and danceable album points to ’80s synth-pop as a major influence. I couldn’t pin down a specific likeness, though—maybe because the album contains a piercing sincerity that channels would-be melancholy into brisk, forthright energy. 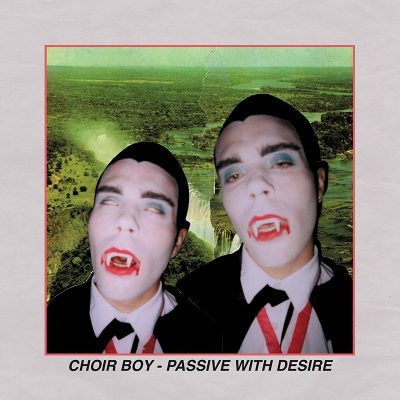 Passive with Desire’s sincerity and emotion set Choir Boy apart. “Two Lips” opens the album up, setting the mood: mystery, vague loneliness and the cold. Each song calls to mind the aloneness of winter nights, when there are too many small lights glinting off dull ice and not enough people in the streets. Gothic, dark bass opens up “Two Lips,” preceding a silvery guitar part that launches the song into a dynamic, shifting swathe of noir imagery and infectious synth-pop, over which Adam Klopp’s voice broods and croons, reinforcing the drama. In the equally compelling follow-up, “Angel Dog,” Klopp begs that someone “take me away from here,” and his plea continues in “Leave Me Be,” for obvious reasons. This lyric is sung over dully glinting synths and panging guitar that froth together so infectiously that you might be teary-eyed if the song didn’t exist on an album that seems to be inspired by dry-eyed weariness. Nostalgia and sadness pervade “I Feel How the Snow Falls” and “Blood Moon,” where Klopp sings from a lonely night’s vantage point about Christmastime but also wants to leave his body in the former and paint the loss of a past self into the dark rhythms of the latter. “Hellmouth” departs a little from the synth-heavy sound, with violin fluttering above the tinkling keys and with the in-tandem voices of Klopp and Katrina Peterson, who clip and round their syllables and consonants in a way that makes the heart thump.